OWWA Scholar Nathalia Jann Biluan (left) takes pride at being a registered pharmacist, after passing the licensure examination on January 2016. 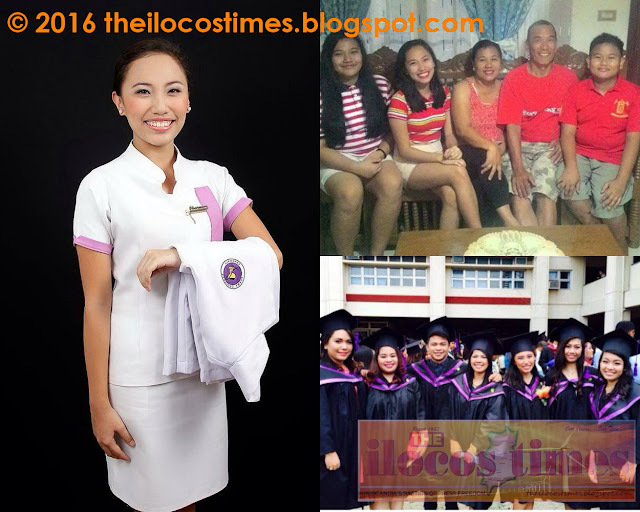 Sharing her pride is her family, especially his father, OFW Renato Biluan (fourth from left, top), and her classmates at Lorma Colleges, City of San Fernando, La Union. Scholars of the Overseas Workers Welfare Administration Regional Welfare Office I (OWWA RWOI) have recently passed the Licensure Examination for Pharmacists, and now join the roster of OWWA Scholars who now enter a new milestone in life by becoming professionals. Sharmaine Gale Daos and Nathalia Jann Biluan, both scholars under the Overseas Filipino Worker Dependent Scholarship Program (ODSP), have passed the licensure examinations administered last January 24-25, 2016. Mss. Daos and Biluan, both 20 years old, have earned their Pharmacy degree at the Lorma Colleges in the City of San Fernando, La Union. They graduated in March 2015. OWWA Scholar Sharmaine Gale Daos (leftmost) beams with pride during their graduation day on March 2015, as her mother Violeta and brother John Wayne joins her. Daos is the daughter of OFW Jimmy Daos, who works in a construction company in Saudi Arabia. 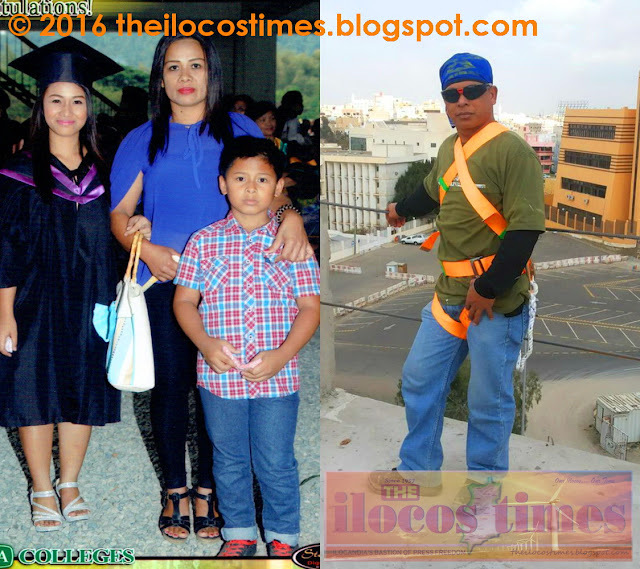 Ms. Daos is the daughter of OFW Jimmy Daos, 44, who works in a construction company in Jeddah, KSA for three years now. Since the head of the family is away, Ms. Daos and her 10-year old brother John Wayne are taken care of by their mother, Violeta. The family hails from San Eugenio, Aringay, La Union. Ms. Biluan, on the other hand, is the daughter of OFW Renato M. Biluan, 51, who worked as steel fabricator in KSA for two years. The Daos family, including the mother Lilia and two other children Nadnine Janette and Noeh John Ren, resides in Lioac Sur, Naguilian, La Union. The newly-registered pharmacists are keen in entering the so-called real world, as they are excited to become full-fledged pharmacists. Both of them are now employed in local pharmacies in La Union. “We want to practice our profession here in our home place first because we want to serve our neighbors,” said the ladies. “But when the right time comes, we also dream of going out for self-development,” they added. The scholars are thankful to the OWWA for all the support extended to them in their schooling. “The OWWA scholarship didn’t only help us financially, but also made us responsible students because we had to do good in our academics,” shares Ms. Daos. “The scholarship also made us strive so that our family, especially our OFW parents, will be proud of us,” added Ms. Biluan. The ODSP offers educational assistance of P20,000 per school year to a qualified dependent of an active OWWA member-OFW whose salary is not more than US$400. To date, the OWWA RWOI maintains 168 ODSP scholars, taking up various baccalaureate degrees in different universities and colleges in Region I.